Rousseau Giving Love and Lions, 1962; acrylic on canvas, 76 1/2 x 51 1/2 in. 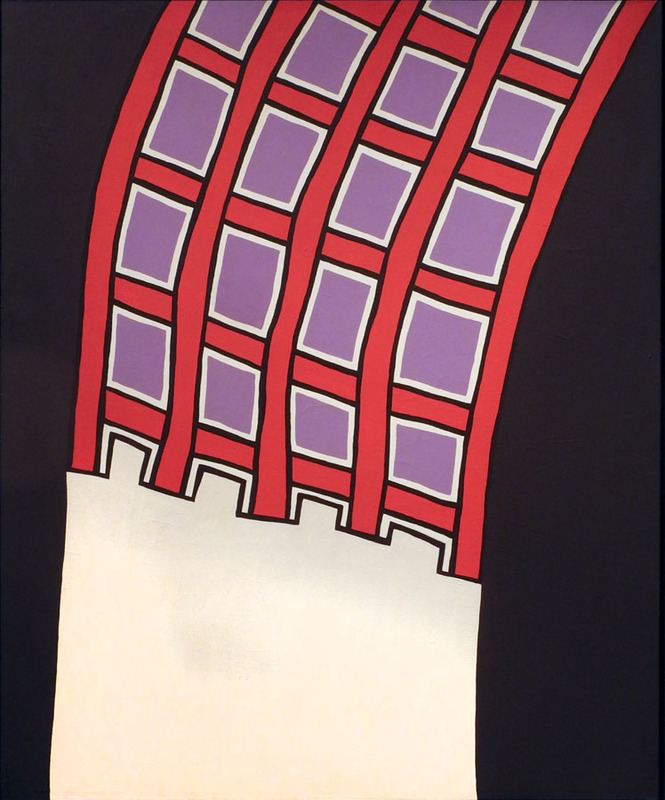 Nicholas Krushenik (1929 - 1999) used the elements of cartooning––bold colors, simple shapes, black outlines––to create vivid and inventive abstract paintings. 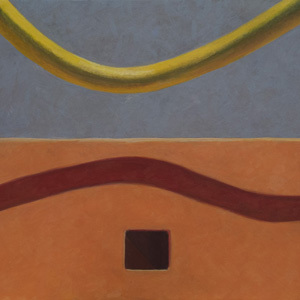 A show of his early work, currently at Garth Greenan Gallery, is a visual delight, with each painting exploring very different ideas of color and shape in space. With all their emphasis on flatness, they are not at all flat, but bend and curve and wobble with vigorous energy. His titles are wonderfully allusive, as in this painting's reference to Henri Rousseau. Rather than thinking of jungle greens, however, my immediate response was to weaving with this pattern and its bulging irregularity. The paint was anything but flat in Krushenik's paintings. I enjoyed seeing the history of changes and the subtle layering of color that looked solid from a distance. Quick Red Fox, 1963; acrylic on canvas, 84 3/4 x 55 1/2 in. Blue and yellow wave pointed ends as though a tattered banner. Their intense color floats above a neutral gray, an unusual color in this show. 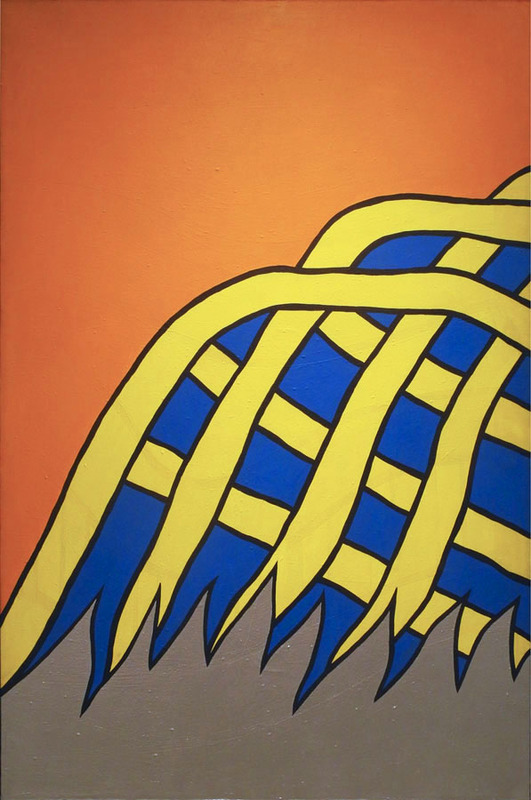 Looking at this painting, I see how the black lines separate the colors, but also pop them out toward the picture plane; even though it's an intense color, the orange settles back as background with no black lines for contrast. 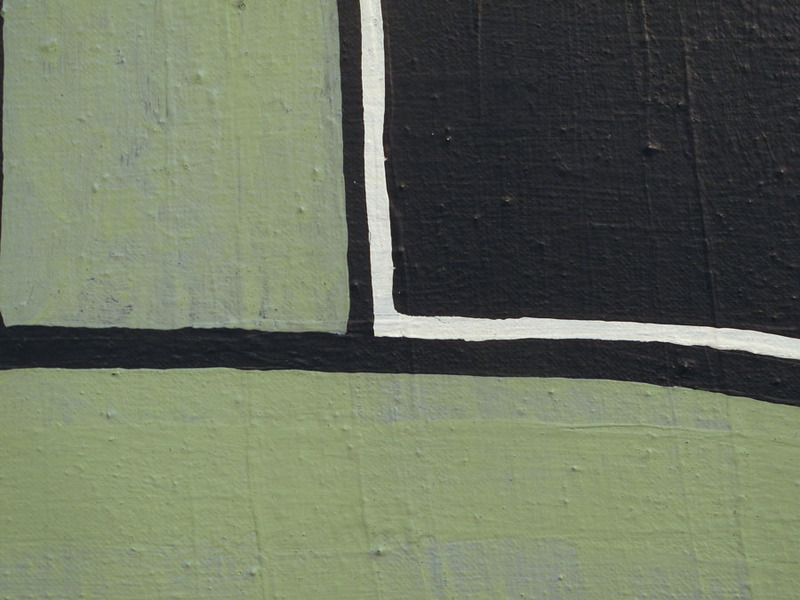 Horizontal Stripes, 1963; acrylic on canvas, 84 1/4 x 51 1/2 in. These horizontal stripes aren't quite horizontal (I sense a joke here), with red flames licking the yellow and white. This painting flows downward, and white points push aggressively into the red, creating a figure/ground quandary. 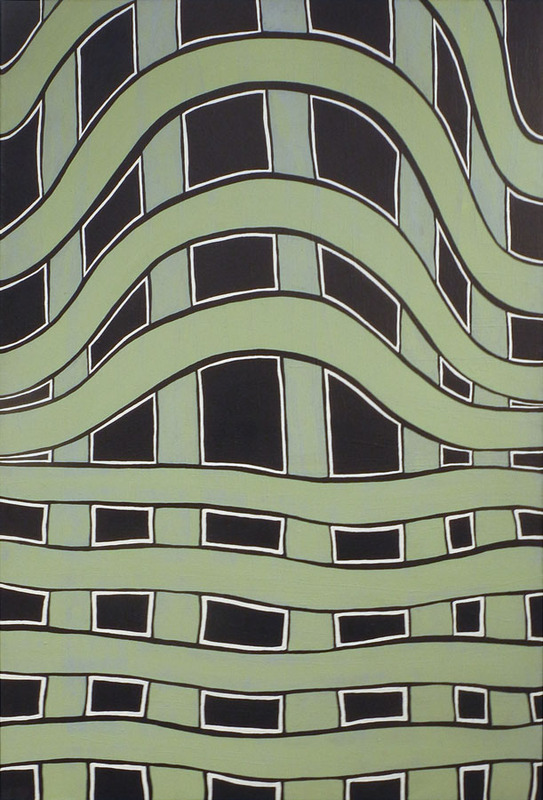 Pango-Pango, 1963; acrylic on canvas, 80 1/4 x 47 in. I'm having fun trying to decipher Krushenik's titles: Pango-Pango is the former name of Pago Pago, the capital of American Samoa. I don't quite see anything tropical in this image, but I do love the flip-flop of the two blue eyehole forms above the red and yellow "mat" (again I see weaving). 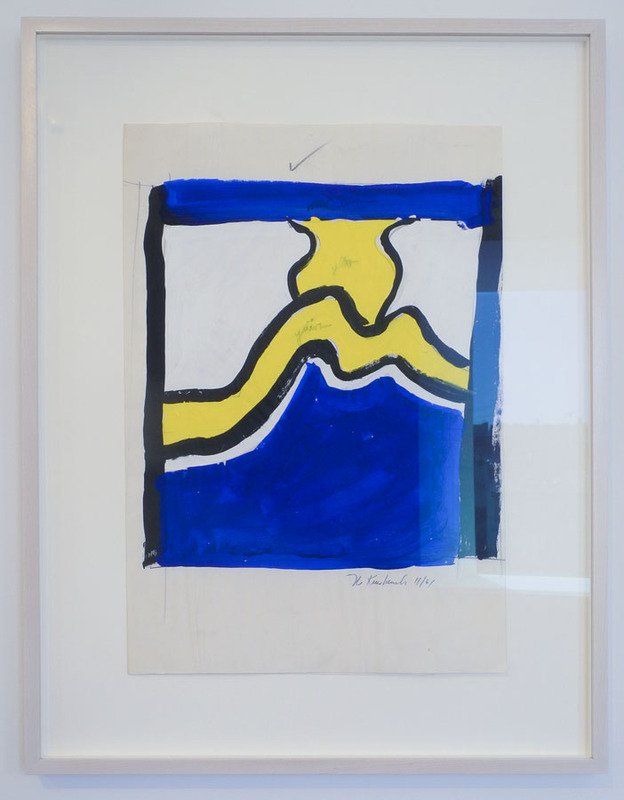 There's a great deal of clever image-play in this piece, with the blue shape above being twisted by insertion of a black line, while the one below is flatter, but....it looks at though it is folded up from the blue surround, where it sits in front of the red/yellow forms. The black lines at top and bottom push those blue shapes together. The seemingly simple has great complexity. 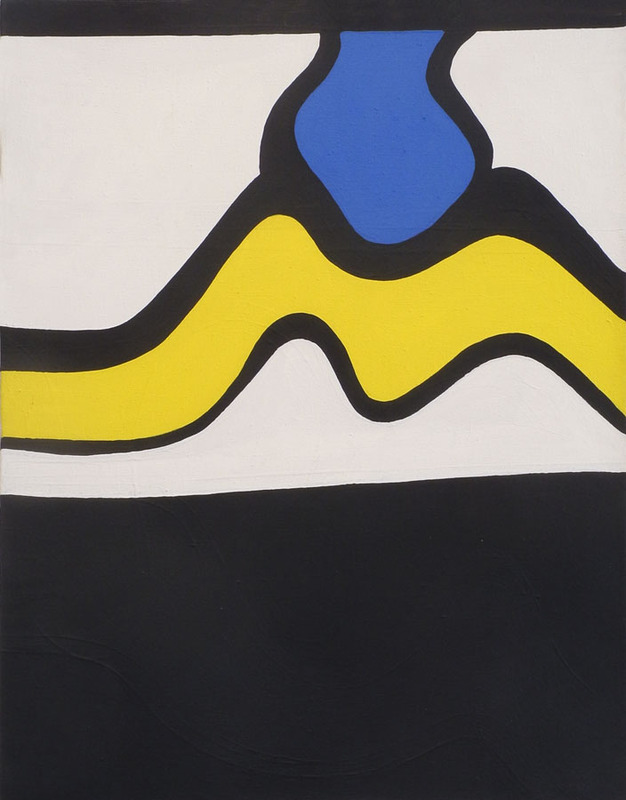 Sterling Moss at the Esses, 1962; acrylic on canvas, 65 3/4 x 52 in. 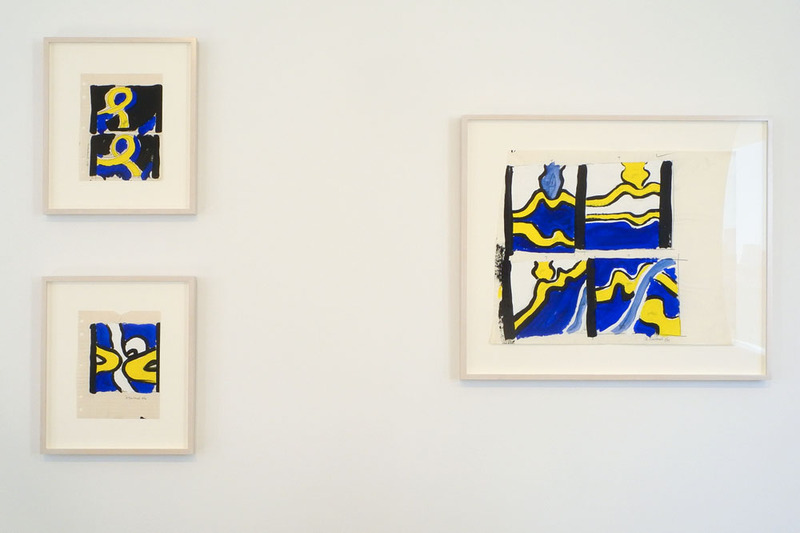 Most of the paintings in the show are in a vertical format, and each uses the format differently. 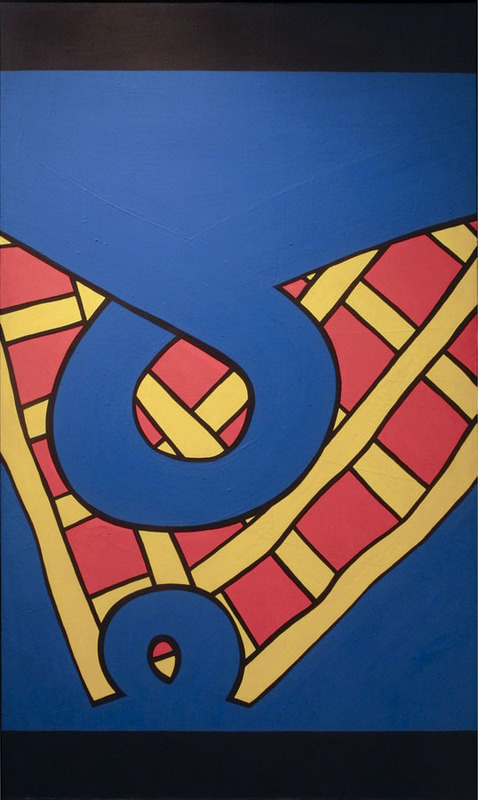 Here another woven group of shapes move downward but don't quite make it to the bottom of the canvas. Could it have something to do with who Stirling Moss is? This title was so mysterious that I googled and up came the race car driver Stirling (not Sterling) Moss, and Esses are curves on a racetrack. Was there an accident? But leaving out the possible narrative, in a nervy way, the artist abruptly ends the red and purple shapes, leaving a white shape that is startlingly present. 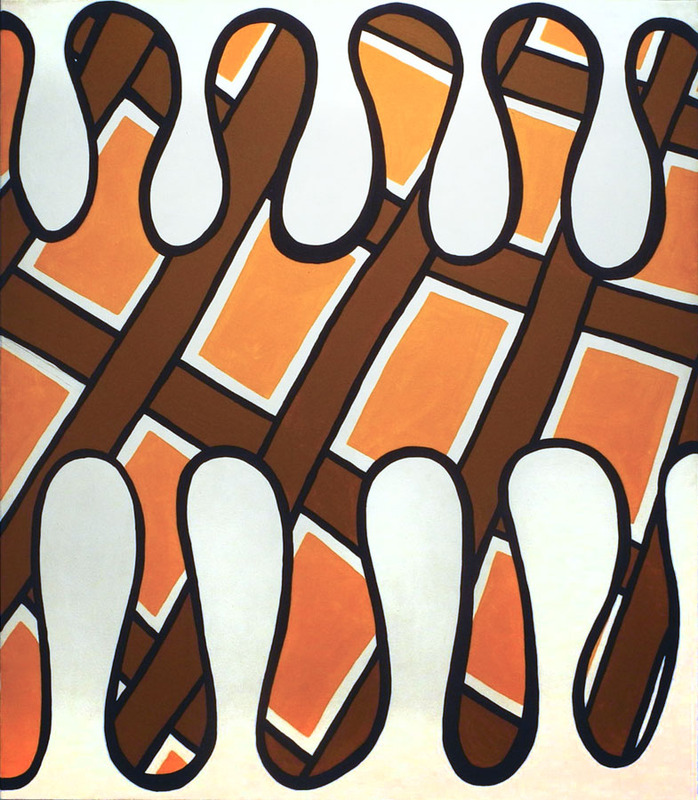 Your Fastener is Disengaged, 1962; acrylic on canvas, 60 x 42 in. I laughed out loud at this painting. The bulbous forms are like swaying heads, or like that funny thing that hangs down at the back of the throat, the uvula. As fasteners, we have an amusing time thinking of them all fitting together, like wacky, organic, zippers. They undulate on top of the wavering grid of brown and orange: organic and sorta geometric. Untitled, 1961; graphite and acrylic on paper, 12 1/2 x 8 1/2 in. 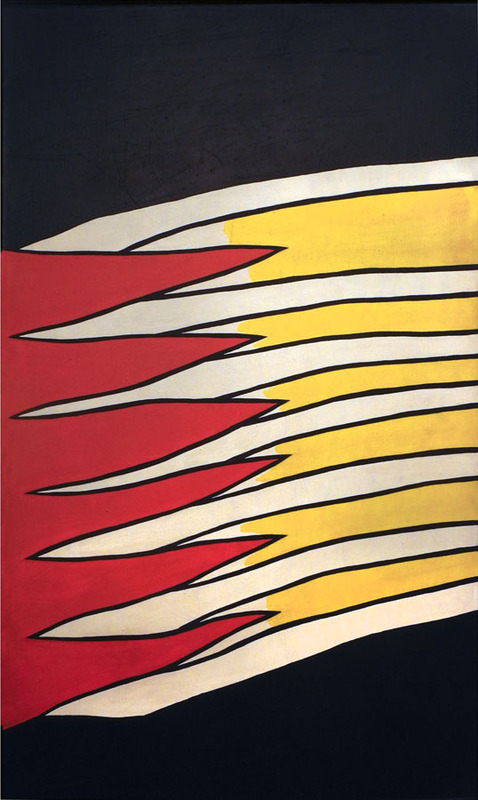 Untitled, 1961; acrylic on canvas, 30 x 24 in. ....and how he ended up. The idea of a squiggly bounded line with a form resting in its curve was clarified and the colors of shapes changed. 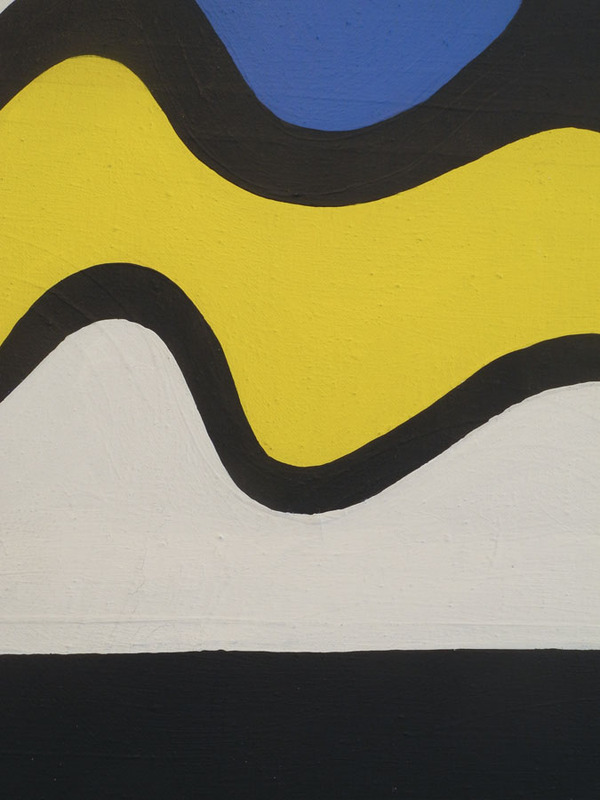 The resulting painting is much more dramatic with the black curving rectangle at bottom, the black band at top; the blue shape has more presence than when it was a less defined yellow as in the study. Looking closely at the small painting (click to enlarge), you can see that there were changes of line and shape in the making of it. It is carefully balanced. 3 drawings, all Untitled, 1961; graphite and acrylic on paper. I love seeing the buoyant energy of these drawings. I see the thought process, especially in the one on the right as the artist tries variations on a theme, one of whose results we see above. 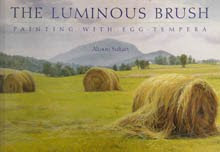 I was so happy to see this show of paintings full of intelligence, quirky beauty, and wit. Wonderful post, I was not aware of this show, thanks. Thanks, Ravenna, I'm glad you liked the post. Thanks! Your writing is great. Thank you for sharing these, and for your sagacity.